Need a low-carb side dish that is quick to make and doesn’t require any cooking? Try Zucchini Noodles with Lime Pesto. It’s gluten-free and vegan too. In keeping with my seasonal eating philosophy, I really should have posted this recipe in the summer when local zucchini and tomatoes are abundant and bursting with flavor. However, I happened to run across hothouse-grown Campari tomatoes in the grocery store and they spoke to me. So did the zucchini. Plus the weather here in Virginia has been in the 70’s. In February. Sometimes you just have to break your own rules. No spiralizer? Don’t worry. Simply julienne your zucchini instead (cut into matchsticks). Can’t find Campari tomatoes? Use cherry tomatoes instead and cut them in half. Feeling lazy? Buy prepared pesto and stir in some lime juice and zest. You can also often find pre-spiralized zucchini. Drop the garlic cloves through the feed tube of a running food processor. Turn the machine off, then add basil, pine nuts, lime zest, lime juice, salt, and pepper. Pulse until finely chopped, scraping sides once. Turn machine back on and slowly pour olive oil through the feed tube in a steady stream until a thick paste forms. Set aside. 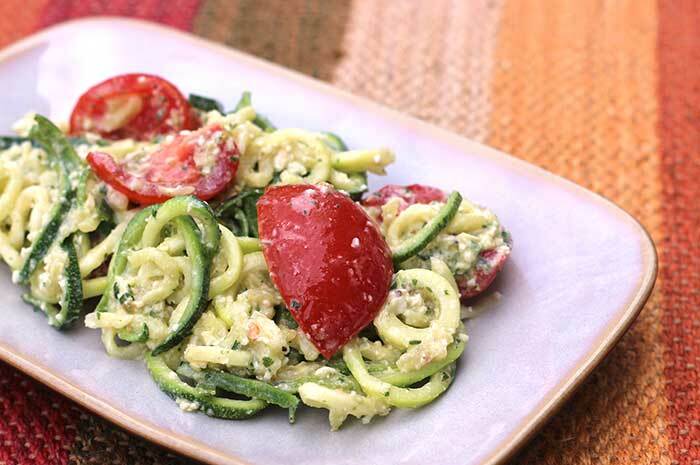 In a large bowl, toss the zucchini noodles and tomatoes. Add a couple of tablespoons of pesto and mix well. If you like the consistency, save the remaining pesto for another use. If you want more creaminess, add more pesto. Campari tomatoes are smaller than regular tomatoes, but larger than cherry tomatoes and they are very sweet. If you can't find them, use cherry tomatoes and cut them in half. Leftover pesto will keep in the refrigerator for about 2 weeks.